NEW 2013 Lunt Sterling Silver 25th Annual Snowflake Christmas Ornament. 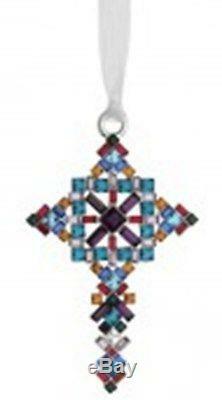 NEW 2013 Lunt Silverplate Swarovski Jeweled Cross Christmas Ornament. Lunt (now owned by Reed & Barton) presents the 2014 Annual Jeweled Cross. The beautiful design and rich colors in the 4th edition of the Annual Cross in silverplate by Lunt is reminiscent of stained glass windows in the grandest cathedrals of Europe. This striking design, created with the artful combinations of sparkling Swarovski elements in a stunning mix of colors, shapes and sizes, is sure to become a treasured collectible. Elegantly packaged for gift-giving and storage. Includes a white organza ribbon for hanging. 3" H x 2 3/4" W. As a result, the following series are no longer in production: Sterling Angel, Santa, Williamsburg and Pierced Cross as well as the Silverplate Cross and Snowflake. The Lunt label has been totally eliminated. If by some small chance your item is not satisfactory, your return should still be received within 7 days or less. Be sure to check my other listings for more great Reed & Barton ornaments and crosses and other fine Christmas ornaments, collectibles, Victoriana, elegant glassware and more!!! Your store for more Christmas! It may be in the "To Be Listed" inventory. The item "2014 Lunt 4th Annual Silver Swarovski Jewel Cross Christmas Ornament Reed Barton" is in sale since Tuesday, June 03, 2014. This item is in the category "Collectibles\Holiday & Seasonal\Christmas\ Modern (1946-90)\Ornaments\Metal". The seller is "dkoldtiques" and is located in Barry, Illinois. This item can be shipped worldwide.